Lt. Harry Colebourn made a crucial contribution to the world of children’s literature and culture, even if it was wholly unanticipated. The historical events that brought together the bear and the author of one of the most enduring classics of children’s literature (not to mention a global popular culture phenomenon) are by now widely known: while travelling by train to Valcartier Quebec, where he would join the Veterinary Corps, Colebourn purchased a female black bear cub in White River, Ontario from the trapper who had shot its mother. 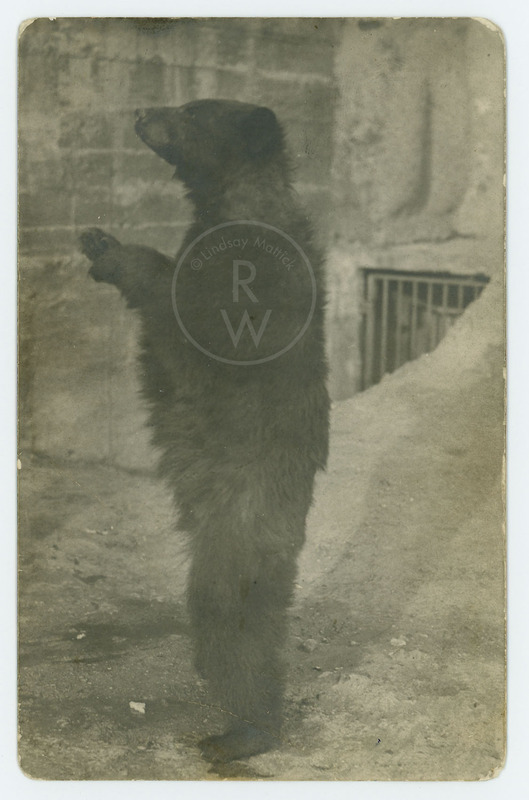 He named the cub “Winnie” after his hometown of Winnipeg, and brought her with him when he shipped out to England at the beginning of World War I. The cub became the unofficial mascot for the Fort Garry Horse, the regiment to which Colebourn was attached as a veterinarian. When he was deployed to France, Colebourn left Winnie in the care of the London Zoo; by the time he was able to return to London after completing his service some four years later, Winnie had become an extremely popular attraction at the zoo, prompting Colebourn to donate the bear permanently. Winnie remained one of the London Zoo’s most beloved inhabitants until her death in 1934. It was at the zoo in Regent’s Park that a young Christopher Robin Milne first saw the now-famous Winnie; he became so enamoured of her that he named his favourite teddy bear after her and obliged his father to take him for repeated visits to see her. Winnie was such a tame, gentle bear that on at least one occasion her keepers allowed Christopher into her pen to play with her and feed her condensed milk from a spoon. Inspired by his son’s love of Winnie—both the live and stuffed versions—A.A. Milne, already an established author who had never before considered writing for children, penned the verse from which the Winnie the Pooh character would grow: “A bear, however hard he tries,/ Grows tubby without exercise.” These lines were the opening of a poem entitled “Teddy Bear,” which was introduced to readers first in the humour magazine Punch then later included in Milne’s collection of children’s verse, When We Were Very Young (1924). Teddy Bear would take his more familiar name in Milne’s most acclaimed work, Winnie-the-Pooh (1926), and would feature prominently in a second collection of poems for children, Now We Are Six (1927) and a second volume of stories, The House at Pooh Corner (1928). The four books, all beautifully illustrated by Ernest H. Shepard, that make up Winnie’s literary legacy have been translated into virtually every written language; one recent estimate put total sales figures for the books since their original publication at over seventy million copies.